Gov. 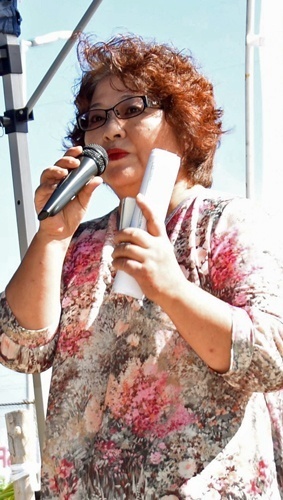 Takeshi Onaga's wife Mikiko encouraged citizens at the sit-in protest in front of the gate of Camp Schwab in Henoko, Nago, on November 7. Mikiko visited Henoko in September when the people’s protest rally was held. In her speech to sit-in protesters, the governor’s wife revealed the details of a conversation she had with her husband when he won the gubernatorial race. “My husband said he absolutely would not let the government build the U.S. base in Henoko. My husband and I promised we would stage a sit-in protest here if we came to the end of our rope,” she said. She received loud applause and cheers from the sit-in members. She took part in the sit-in and spurred on the citizens, shaking all of their hands.